Since Toxics Action Center opened our Vermont office in 2002, we’ve worked with community groups to close down old, unlined or leaking landfills; to prevent new landfills from being built; and to increase recycling and solve our trash problem. In 2012, you helped these groups take the next step and pass Vermont’s Universal Recycling Law, which bans disposal of food scraps, recyclables, and leaf and yard waste across the state. Since the Universal Recycling Law went into effect, communities across the state have diverted tens of thousands of tons of trash from landfills. And in places like Bristol and Moretown, community groups have also won big victories after pressuring polluting landfills to retire. Watchdogging the landfill closure process is ongoing work. 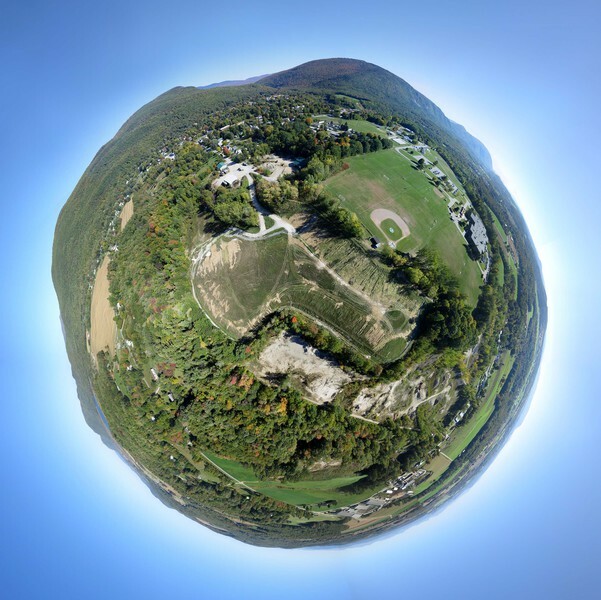 Last October, local landfill activists from Bristol joined University of Vermont students and Public Labs Citizen scientists in conducting an aerial mapping project to assess how the landfill closure has gone. We attached a camera to a weather balloon filled with helium to take pictures looking down on the closed landfill. Toxics Action Center’s Vermont State Director Shaina Kasper described the process as inspirational citizen science that gave community leaders the ability to get a “thousand-foot view” of the landfill capping, including areas that had been repaired and reseeded. As Vermont continues to lead the nation in the move to zero waste, your support is allowing residents to make sure that strong closure plans are in place for existing landfills, and helping them to watchdog the process and ensure groundwater is monitored for years to come.